I am always on the lookout for new ways to use things I have laying around the house. Those little plastic Easter eggs are no exception. They have had many uses for me besides just a place to store candy. I have used them as molds for my fruity pebble pops, as bath toys, as sand box toys, and now as lunch servers. My mom has always said that when I was little and she needed to take a shower or get something done during the day, she would fill a muffin tin with different finger foods for me to eat while she got 10 minutes to her self. I loved the idea so much, that I routinely do the same for my daughter. She loves to eat her breakfast or lunch out of the little muffin tins. Thus, when I was thinking about another way to use my plastic Easter eggs, the two came together in my mind and here you have her Easter egg lunch. 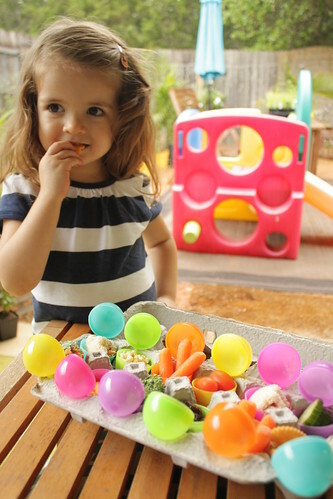 I filled each egg with some of her normal lunch time eats including baby carrots, cucumber, broccoli (from my garden! 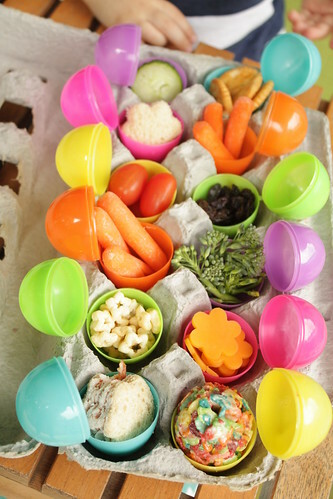 ), little turkey sandwiches cut into flower shapes, cheese cut into the same flower shapes, raisins, crackers, puff cereal, grape tomatoes, and a little dessert rice krispie treat egg. All the eggs could close and when in an egg carton are perfectly portable for school. I think I might send her to Mother’s Day Out on Friday with her egg carton lunch. As you can see, she loved today’s lunch, but how could she not? I want to eat my lunch like this too! 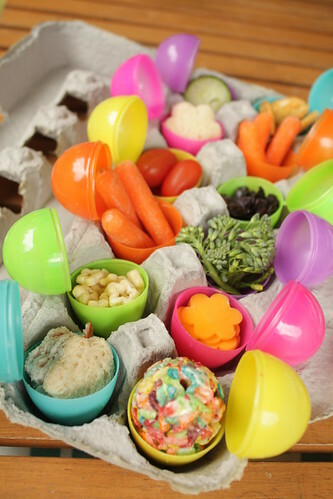 Have fun creating your own version with snacks you or your little one love and then head out for a spring and Easter themed picnic, even if it is in your own backyard! What an adorable idea & even more adorable little girl you have! I love it we are using this idea for our preschool Easter party. Absolutely adorable…what a great idea! I've shared this with my niece because I just know my great-niece would love this! I'm totally trying this! Thanks for the inspiration! this is soooooo adorable, and so is ur kid! So fun! We will be doing this for our celebration of Spring arriving! This is genius AND fun! Great idea!